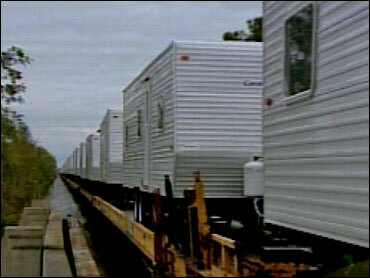 Four months after Hurricane Katrina, efforts by the Federal Emergency Management Agency to place displaced victims into trailers are being hindered by communities balking at hosting such trailers, reports CBS News Correspondent Trish Regan. Many families from New Orleans are still living in tent cities, shelters and hotels while they wait for FEMA trailers to become available. The problem is particularly pressing for those staying in hotels, since FEMA only intends to foot those bills through January, Regan says. She spoke with Schwanda Richard, who lost her home to Katrina and has been crammed into a hotel for months. "We gotta get out of here by the end of next month," Richard frets, "so we're gonna get out. … We're gonna have to get a trailer. And it seems they're taking so long to get us a trailer, and we're trying to find out what is the problem." The problem, Regan explains, isn't that there aren't enough trailers available. They're seemingly everywhere: on rail cars, in parking lots, on softball fields. FEMA says it has nearly 18,000 in Louisiana. The trailers are, as Regan put it, all dressed up, but with no place to go. Everyone agrees the trailers are a good idea, Regan observes. But nobody, it seems, wants them in their neighborhood. Shea Craig lives next door to the Lakewood Country Club in New Orleans. Mayor Ray Nagin announced plans to put 1000 trailers there. "It was just scary being a single mom with an eight-month-old and not knowing 5,000 people living in the thousand trailers across the street," she says. Julie Hunt also worries about new neighbors on club grounds, telling Regan, "We moved here to have a nice neighborhood and a safe place for the kids, and you just gotta worry about so many people in such a small area." The neighborhood's city councilman is battling Nagin's proposal. At FEMA's largest-ever trailer park, in Punta Gorda, Fla., built after Hurricane Charley last year, accusations about drug dealing, domestic abuse, theft and vandalism were rampant, Regan says. Despite those concerns, some, such as New Orleans resident Virginia Dengel, say this extraordinary event requires extraordinary cooperation: "It's not business as usual, for God's sake. It's not business as usual. It's an emergency." But, Regan points out, the mayor and City Council can't seem to get beyond politics as they continue to argue over where the trailers should go. In the meantime, thousands are in need of the trailers. And, Regan notes, the NIMBY effect goes beyond the Big Easy itself: Half of Louisiana's parishes have banned new trailer parks.